Saba first started working with clay at UC Berkeley’s ASUC Art Studio in 2004. 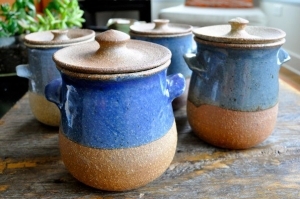 In 2009, she joined The Clay Studio in San Francisco, where she had the opportunity of learning the techniques of making functional pottery from John DeLois and Joyce Fujiwara. Saba looks for inspiration from historical functional pots from around the world and especially likes to make pieces that connect clay to food. Saba joined sfclayworks as a Hands-Up technician in 2011, a position she held for two years, helping with recycling clay, glaze production, and kiln firings as well as continually learning about the magical world of clay. Though Saba is no longer working actively as a hands-up member at the studio, all of us in the studio are firm in our belief that Saba was and always will be a member of the sfclayworks family. Saba “came on board” the sfclayworks train when we took our maiden voyage out of the station after the closing of The Clay Studio. As one of our original hands-up participants, Saba helped establish the high standards that we expect from our studio assistants. We will always be grateful that Saba had faith in us as we embarked on our studio formation. Outside of her interest in ceramics, Saba can be found at various pop-up events showcasing her delicious small batch jams. Since 2012, Saba also joined sfclayworks SF Open Studios events selling her incredible saba jam preserves and sweets at the front of the studio. Through the years saba jam has built up quite a fan base among the friends of the studio. To learn more about her unique flavor combinations and to see what she has been up to please visit her website sabajamsf.com.